How much is a Decibel? The term Decibel gets thrown around a lot in the audio world like it’s an actual value, but in reality it is not. 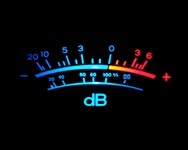 A decibel is actually a ratio and only means something relative to the value it is compared to. To further complicate matters, it is a logarithmic ratio between two values. First, logarithmic deals with exponents to determine the value so at the beginning of the scale the changes are small but as you go further away from the staring point the changes accelerate exponentially. Grab any graphing calculator and graph y=x^2… you’ll see a nice curve that quickly ramps and keeps ramping up as it goes further from 0 in either direction, making a parabola. Logarithmic scales are pretty much the inversion of that, so if y=x^2, then x=log2(y). That right there was a log base 2, however in the electronics and audio world log base 10 is the common standard. If fact, if you hit that “log” button on an old school calculator that means log base 10. Because it’s a easy way to express very large ratios. Sound in particular can deal with extremely large ratios and it’s way easier to say 100dB than it is to say 10,000,000,000 to 1. In fact the human ear has a dynamic range of as much as a trillion to one, so a logarithmic scale is ideal for use in sound. On top of that, the human perception of changes in loudness get wider as the sound pressure is increased, just like a logarithmic calculation does. Because of that, you’ll find many scales on EQ’s, mixers, volume knobs, and other things on audio gear are marked in Db instead of ratios. You’ll find that volume knobs are actually made on a logarithmic scale intentionally, so the first 50% of the knob’s travel only allows 10% of the signal through, the other half of the rotation covers the other 90%. You’re ears won’t tell you that though, you’ll perceive a fairly even increase in volume as you turn the knob. Sound pressure is measured as a power ratio from the smallest amount of energy the human ear can pick up. This makes 120dB is a full 1 trillion times greater than that. The initial level defined for that smallest amount of energy that’s audible is possibly arguable for anyone who’s stood next to a drummer for a few hundred gigs, but it’s been decided and coded into an ANSI standard so the sound pressure meters out there are likely to give the same numbers. The beauty of the decibel in audio is that it is simply added throughout the chain even if the dB measurements are in voltage gain, power, or sound pressure. So if you’ve got a speaker humming along measuring an output of 90dB and you double the input voltage to the system, you can quickly figure out what the resultant sound pressure will be. Doubling the voltage will get you 20*log(2/1) or 6dB. Add that to the 90dB you were sitting at already and you’ll end up with 96dB of output. Doubling the power into the speaker gets you half that for a 3dB increase to 93dB. How many dB’s does it take to hear a difference? Generally, a change of 3dB will sound like a significant, but small change in perceived volume. It takes a change of about 10dB to sound like it got twice as loud. At this point you may notice that it takes twice the amplifier power into a given speaker to make even a 3dB change in volume, and a full 10 times the power to make it sound twice as loud. What that means to the typical consumer is that output power of your amplifier is a exercise in diminishing returns. Have a 100W per channel amplifier now? You’ll need 1,000W to get twice as loud (and thus well beyond the budget or power handling of your speakers). So the lesson there is that spending extra money on a 150W amp over a 100W amp isn’t really all that smart, as the extra power will only get you 1.8dB more volume. Speaker efficiency is typically measured with one watt of input into the driver at a distance of 1 meter. This specification varies anywhere from 80 to 100dB and has a huge effect on your maximum loudness or sound pressure level. Hi-Fi or studio monitor speakers may have lower efficiencies caused by their focus on broad frequency response while pro audio stage and instrument speakers sacrifice the accuracy for efficiency. Think about this… a speaker with an 100dB efficiency will sound 4 times louder than one with 80dB efficiency with the exact same power input. So if you want a really loud system to overcome the hearing loss you’ve incurred from listening to really loud systems, look for really efficient speakers over massive amounts of power.